I realize that I appreciated my father-in-Law last Gratituesday when I told you that he had come from California to help us insulate our living room…but after watching him work and work and work all week long I can’t think of anything or anyone else that deserves a shout out again this Gratituesday. Prepping walls so that you can insulate them is NOT easy work. Prepping walls to put drywall up after insulating them is NOT easy work. Matt has, of course, had to go to work most of the days his dad has been here. I am unable to help because plaster dust is the last thing my asthmatic lungs need. My father-in-law (if a girl can say such a thing about her father-in-law) has been a rock star. He has put in so many hours of hard labor that he will for sure need a vacation from this vacation. Oh, and in between jobs in the living room…he’s been thoughtfully working to get the drains in our bathroom to work better. I feel so cared for. Have I mentioned that he’s the one responsible for the fact that we have a working dishwasher? Both Matt and I agree: This project would have never happened without him. We are so very grateful. We’re a little bit farther along than this now…but here are the walls with insulation sprayed in. Looks like another round of tomato sauce is in the works. I agree he definitely deserves another round of gratitude! That living room picture is scary Laura. What a beautiful blessing it will be when it is finished. I too have a fabulous father in law, what a HUGE blessing. It is such a blessing to have wonderful in-laws! I am grateful for mine as well! What a mess, but what a blessing! My husband is a carpenter so I know the work that goes into a remodel. You’re going to love it so much when it’s done. My tomatoes are still going too here in Tennessee. They are better quality than they were this summer, probably because it’s not so hot and the worms and bugs aren’t so bad right now. Last year mine were done by the first of August. But we also had a tornado come through in July and beat them up a bit! 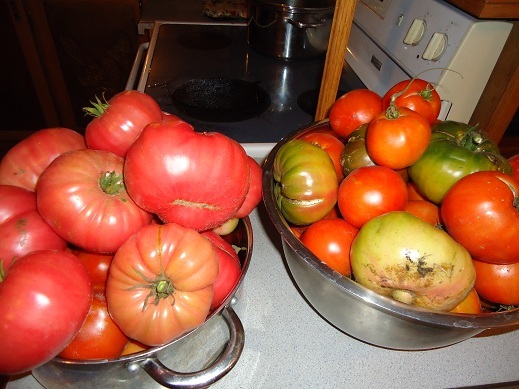 Next year we have to either completely get rid of tomatoes (‘cuz that stuff lives in the soil for years) or spray. Sigh. What a wonderful father-in-law Laura!! 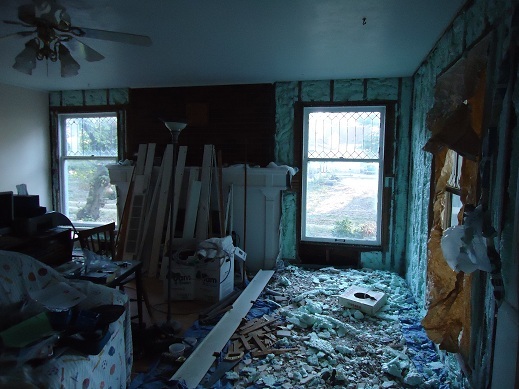 Your gratitude will continue all winter with insulation in the walls! Your father-in-law IS a rock star. My father-in-law did many things like this for me for years – only requesting pie as payment. He went to be with his Jesus two years ago and I miss him so much. Hug your father-in-law for me!! so happy you’ll be warm and cozy this winter…insulation goes along way in keeping a house warm and cool, it also keeps those utility bills down!! Today i am thankful for realizing that my children should always come first. Before house cleaning, before cooking, before work. I have been burning myself out, working 40 hrs a week, plus taking care of my home and children. I was becoming famous for saying, “not right now, i’m busy, go play.” so for a week now i have stopped trying to keep my house spotless, and have spent more time cuddling and playing with the kiddos. who cares if there is toys from one end of the house to the other, who cares if the floor needs sweeping AGAIN, i have stories to read and kisses to give. Don’t get so wrapped up in the day to day that you forget to put your angels first……blessings to all!!!! I finally joined in for Gratituesday– I have been meaning to do it for so long. Thanks for helping me show my gratitude!! I think I would call anyone a Rock Star if they installed insulation. That is not a fun job. You will blessed year round by his efforts. Now, if we could only find you a “fairy godmother” to bibbidi-bobbidi-boo the mess away. I am loving Gratituesday! It’s so good to reflect on the blessings in my life. New to this meme~ Thanks for hosting! I’m a little late in posting, but I am grateful that all of our family has been/is healthy so far this fall. We’re having to stretch every dollar as it is, so I’m really glad that *so* far we haven’t had any unplanned visits to the doctor. And by the way, I agree, your FIL is a total rock star. My FIL would NEVER volunteer to help us do something like that, so I’m a little jealous :) Just a tad. If I were you, I’d be telling everyone I came in contact with how wonderful he was for helping you take on that project. Hope you enjoy it this winter!